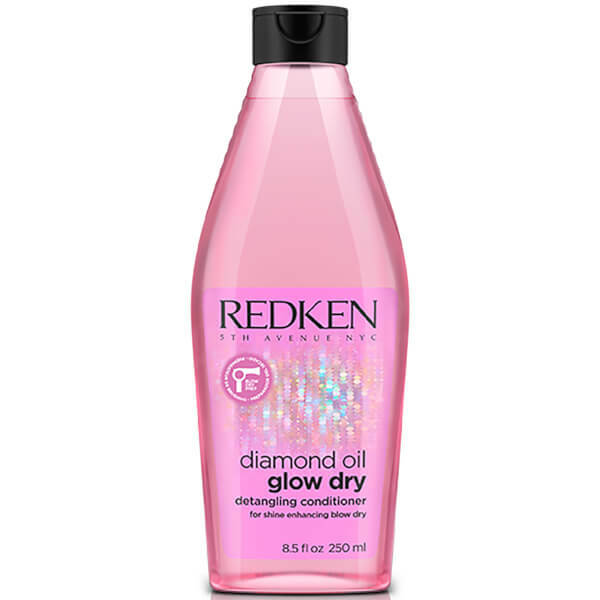 Restore luminous, glossy locks with the Redken Diamond Oil Glow Dry Conditioner; a replenishing, revitalising formula that works to detangle and hydrate hair. Harnessing the powers of Amla Extract and Coriander Oil, the conditioner infuses strands with weightless moisture and shine, whilst softening and smoothening hair for a salon-worthy finish. Tresses are left smooth, sleek and glistening from root to tip. After shampoo, apply and distribute through hair. Rinse and towel dry. Aqua/Water, Glycerin, Peg-40 Hydrogenated Castor Oil, Caprylyl/Capryl Glucoside, Hydroxyethylcellulose, Behentrimonium Chloride, Parfum/Fragrance, Phenoxyethanol, Polyquaternium-10, Hydroxyethyl Oleyl Dimonium Chloride, Isopropyl Myristate, Quaternium-80, Propylene Glycol, Isopropyl Alcohol, Linalool, Coriandrum Sativum Seed Oil/Coriander Seed Oil, Caprylic/Capric Triglyceride, Sodium Acetate, Sodium Chloride, Phyllanthus Emblica Fruit Extract, Citric Acid.